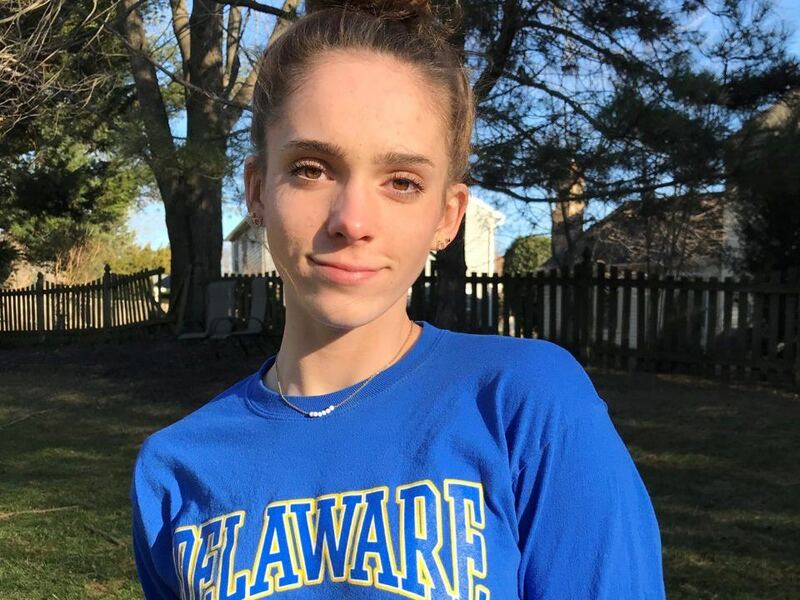 Rockville-Montgomery Swim Club’s Natalie Dobrzykowski has committed to study and swim for the University of Delaware in the fall of 2019 in the class of 2023. Dobrzykowski is a senior at Colonel Zadok A. Magruder High School in Rockville, Maryland, where she is captain of the swim team. She recently competed at the 2019 MPSSAA 4A3A State Championships and placed 2nd in the 100 free (52.05) and 4th in the 100 back (58.89). Both times were personal bests. In club swimming, Dobrzykowski increased her training load for her senior year and moved up to Rockville-Montgomery Swim Club’s National Training Group in April 2018. 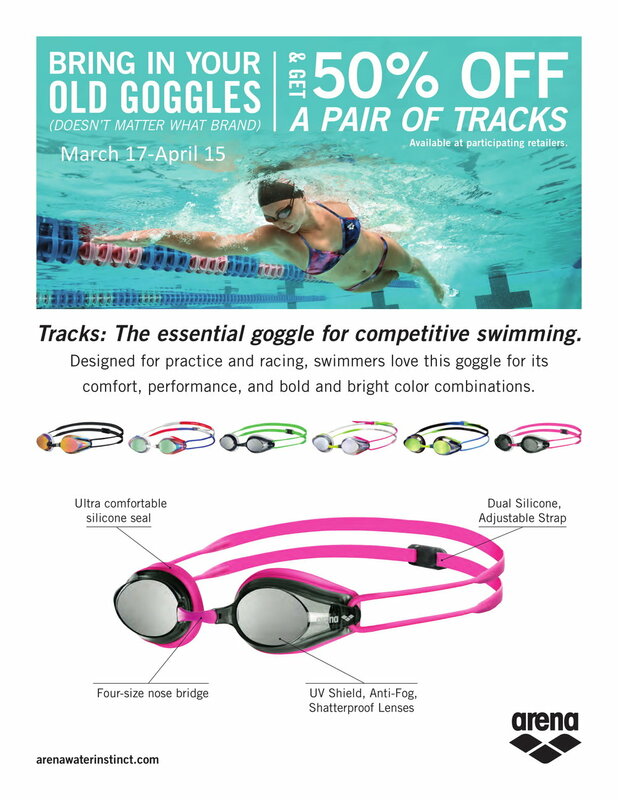 She had a successful long course season last summer, improving in all her events and landing three top-16 finishes at the Eastern Zone Senior Long Course Championships. Dobrzykowski would have been the 2nd-fastest 100 freestyler and 200 backstroker, the third 200 freestyler, and the 6th 100 backstroker on the Blue Hens’ squad this year. In the mixed 200 free relay, Carr led off in 25.53, McCormick split 23.94, then Coapstick went 23.71, and Qin anchored in 24.20 for a final time of 1:37.38. The previous record of 1:38.43 was from 2018. In the mixed 400 free relay, Qin led off in 53.42, then Carr split 54.29, then McCormick went 52.35, and Coapstick anchored in 51.23 for a final time of 3:31.29. The previous record of 3:58.08, was set in 2017. 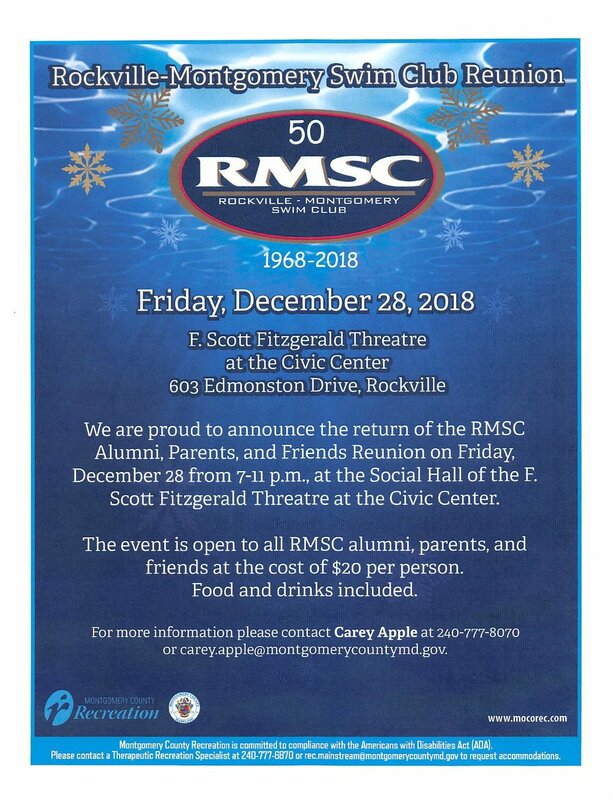 The Rockville Montgomery Swim Club proudly invites all alumni, parents and friends of RMSC to a 50th Anniversary gathering. Held at the Social Hall of the F. Scott Fitzgerald Theatre on the grounds of the Rockville Mansion (603 Edmonston Drive Rockville MD 20851) on December 28th from 7pm - 11pm. Food, Beer and Wine will be available. There will be a $20 charge for this event. We are greatly looking forward to celebrating what is in our opinion, the greatest program that the City and County have ever had. We look forward to catching up with generations past, recent and parents of the current team members. While RMSC was in Greensboro NC at USA Swimming Winter Nationals fellow team member Jorge Otaiza ventured to his home country of Venezula for some competition of his own. Jorge broke the National Record in the 100M Butterfly in a time of 55.92. On his way to victory in the 50M Butterfly he broke the RMSC team record with a time of 25.75, eclipsing the old mark of 25.92. Jorge also finished first in the 50, 100 Freestyles as well as the 200 Butterfly. Narrowly missing the RMSC Team Record in the 50 Free. A small yet fierce group of RMSC swimmers headed down to Greensboro NC to compete at USA Swimming’s Winter National Championships. RMSC finished a combined 7th place with the Men’s team finishing 6th overall. The Men were represented by Alex Colson (15pts), Jacob Rosner (2pts) and Ryan Vipavetz (44pts). Ryan leading the way is RMSC’s newest National Champion winning the 200 Butterfly in a RMSC Team Record of 1:59.43. The swim was also a pool record as well as an Olympic Trials qualifying time. They say there is strength in numbers, RMSC had 3 swimming in the 200 Fly that night. Alex Colson finished just behind Ryan in a 2:01.55 which earned him a 4th place finish and Jacob Rosner achieved a 21st place finish with a 2:07.76. Alex Colson also swam in the 200 IM and the 100 butterfly. Finishing 27th and 35th respectively. Jacob Rosner also competed in the 800, 400, 200 freestyle events. Finishing 15th in the 400 free with a time of 4:02.57. Jacob had a very consistent showing finishing in the top 21 in 3 of his 4 events (20th, 15th, 21st). Ryan qualified for Olympic Trials 2 days prior to his National Title in the 400 Freestyle in a team record 3:56.67 placing 6th. He was also 8th in the 800 Free and swam the 100 Fly (39th), 200 Free (34th). RMSC’s ladies were represented by Catherine Belyakov, Kaitlin Gravell and Joyce Wu. Kaitlin Gravell was able to score 3pts in the 400IM on her way to a RMSC Team Record 4:54.56 and a 14th place finish. She also swam in the 200IM and 200 Breastroke. Catherine Belyakov competed in the 200IM, 100Fly, 100 and 200 Breastroke events. With consistency in her races, placing in each event from 30th-39th. Joyce Wu, our youngest competitor at age 14 swam in the 100 and 200 Breastroke. Finishing in 47th (100BR) and 57th (200BR) we certainly will be watching Joyce continue to hone her racing skills as we head in the RMSC’s Holiday Invitational. Congratulations to all of our athletes who competed at Winter Nationals. With a National Champion and Olympic Trials qualifier, RMSC is looking forward to see what our athletes are made of heading into the rest of the season. If you meet these requirements and would like to apply for the 2018-2019 SAA honors please peak with your child’s coach. Vipavetz hails from Silver Spring, Maryland and attends Good Counsel High School in Olney. He was selected to The Washington Post’s 2018 Winter All-Met team for boys’ swimming and diving after winning the 200 free (1:39.14) and having the area’s fastest 500 free (4:26.91) at the Washington Metropolitan Prep School League championships. Swimming with his club team Rockville-Montgomery Swim Club, Vipavetz broke a 4-year-old meet record in the 200m fly at 2018 NCSA Summer Championship, taking nearly 2 seconds off his entry time to go 1:59.62. He finished 3rd in the 400 free, 7th in the 1500 free, 15th in the 100 fly and 16th in the 200 free, and he took home new PBs in the 50/100/200/400/1500 free and 50/100/200 fly. At the 2018 NCSA Spring Championship he placed 2nd in the 1000 free, 3rd in the 500 free, 5th in the 1650 free, 9th in the 200 fly and 26th in the 200 free. Drew Munson from Olney has committed to swim at Towson University. Munson swims year-round for Rockville Montgomery Swim Club. In both high school and club swimming he focuses on the longer end of the freestyle range, and yet when called upon, he swims sprints. At the 2018 Washington Metropolitan Prep School Swim Dive League Championships in February, Munson competed in the 50/100 free events for Good Counsel. The next week at Metros he swam the 200 free (1:43.89 for 11th) and 500 free (4:39.59 for 5th), both lifetime bests. Erica Hjelle from KSAC will be a Georgetown Hoya! Hjelle does her club swimming with Rockville Montgomery Swim Club and has achieved the Winter Juniors standard in her signature event, the 200 breast. She recorded four lifetime bests and made one finals appearance at NCSAs this past summer after notching a trio of personal bests at NCSA Championships in March. Hjelle is a six-time MPSSAA 4A State Championship finalist representing Sherwood High School. As a junior, she was the 100 breast runner-up and placed third in the 200 IM. She finished fourth in both events as a sophomore and took seventh in the 100 breast during her rookie campaign. 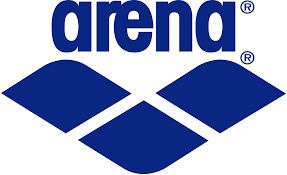 With their swims at the NCSA Junior Nationals last month, Eli Fouts and Ryan Vipavetz qualified to represent Team USA on the NCSA All-American Team in Dublin, Ireland at the Irish Open, held April 4-8. The team arrived in Ireland on March 31, and was able to tour the Country and see the sights before competing. In the pool, the American contingent fared very well against the top Irish athletes, with many appearances in finals and many best times, despite the meet being held in long course meters, and the Americans having swam in short course yards all season. Ryan placed 3rd in 800 free, 4th in 200 fly in a U.S. Senior National cut and 17-18 team record 2:01.51, 6th in 400 free, 7th in 100 fly, top 16 in 200 free, and was part of the 2nd place 800 free relay. Eli was 5th in 50 breast in a 17-18 and Senior team record 28.85, 5th in 100 breast, top 16 in 50 free, 200 breast, 50 fly, and 100 fly, and was part of the 2nd place 400 men's and 400 mixed medley relays. RMSC's Tia Thomas and Sean Santos have been selected for the National Diversity Select Camp. Throughout this camp, athletes who are members of minority populations will be encouraged to become leaders in their swimming communities. There will be pool training, motivational and educational sessions and team-building activities. The swimmers’ coaches have also all been invited to attend. To be eligible for selection, athletes must represent a minority group population that makes up less than 10% of the current USA Swimming membership. The swimmers must be between 14 and 16 years old on the first day of camp and must not have already attended a Diversity Select Camp. There is also a time component to selection. These swimmers must have achieved at least one Diversity Select Camp time standard, found here. The times are current AAAA National Motivational Times for the 13-14 age group. All County facilities are closed until 12pm on Sunday February 4th, 2018. Due to the threat of inclement weather the County has made the decision to remained closed during the weather event. All morning practices as GISC, KSAC, MLK and OSC are CANCELLED. 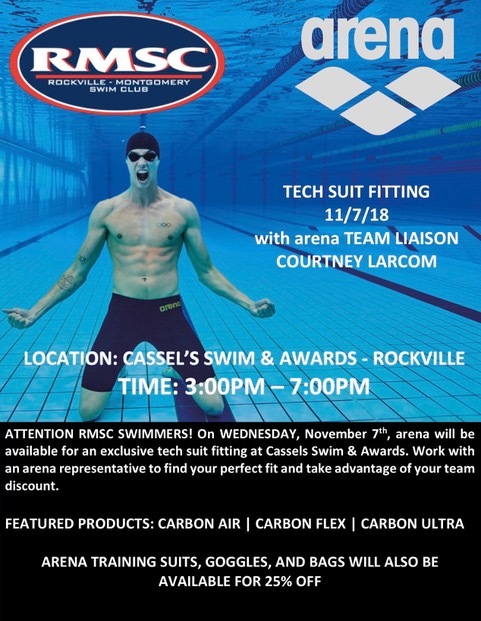 Rockville Swimmers please contact the facility or your coach for your practice schedule. The Gender Blender Mini Meet is CANCELLED for Sunday, February 4th, 2018.